Our client was looking to extend their property with a two storey extension to the rear together with various interior alterations. 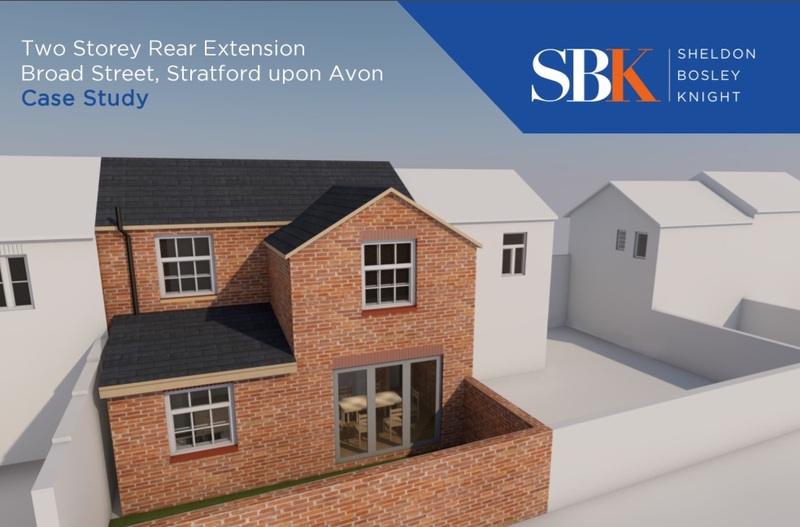 The applicant bought the two bedroom property in Broad Street, Stratford-upon-Avon with the intention of constructing a two storey rear extension to create a 3rd bedroom on the first floor and a larger kitchen/dining area on the ground floor. The proposal involved the removal of the existing ground floor additions and garden room and their replacement with a two storey brick extension. A first floor was only added on the right hand side of the dwelling due to the distance separation guidelines. Due to the property’s location within the Stratford-upon-Avon Conservation Area D a Heritage Statement was required to evaluate the impacts of the proposal on the designated area. The Heritage Statement and the Archaeological Assessment were provided to the Stratford District Council and the application was consequently validated. There were two neighbourhood objections from the adjacent property, there were no objections from the Statutory Consultees, including the Town Council and the application was subsequently approved by the Case Officer. The Planning Specialist was Daniel Jackson RTPI. ← Egg-stravaganza of Egg-cellent Entries!